Workers used to decontaminate the Fukushima nuclear plant in Japan are at grave risk of exploitation, independent UN experts say. Tens of thousands, reportedly including migrants and homeless people, may be being deceived about the risks of exposure to radiation, they say. The UN is urging the Japanese government to act to protect them. 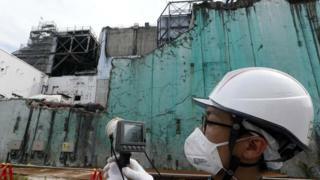 The plant was hit by a tsunami in 2011, causing the most serious nuclear accident since Chernobyl. The UN experts, known as special rapporteurs, said they were also concerned that workers might be being coerced into accepting hazardous working conditions because of economic hardship and being given inadequate training and protection. "We are equally concerned about the impact that exposure to radiation may have on their physical and mental health," they added. Tens of thousands of workers have been recruited under the decontamination programme. However the UN said it was concerned by reports that big contractors had used hundreds of inexperienced smaller subcontractors and brokers to recruit a considerable number of the workers. This may have "created favourable conditions for the abuse and violation of workers' rights", the UN experts said. Workers are "often exposed to a myriad of human rights abuses, forced to make the abhorrent choice between their health and income, and their plight is invisible to most consumers and policymakers with the power to change it," they said. Japan's Ministry of Health, Labour and Welfare says 46,386 workers were employed in 2016 and the Radiation Worker Central Registration Centre of Japan says as many as 76,951 decontamination workers were hired in the five-year period up to 2016, the UN says. Authorities are running an education campaign about the "revitalisation" of Fukushima which aims to provide information and bring transparency to the clean-up process. Yet in many of the areas where evacuation orders have long been lifted only a few former residents have returned to their homes. Fukushima will also be one of the venues for the Tokyo 2020 Olympic Games, with hopes the event will showcase the region's recovery from the nuclear disaster.